The Mobile World Congress has historically been the home of Galaxy S unveilings while IFA is where we welcome the new Galaxy Note. Rumor has it that Samsung is adding one more stop next year – the Galaxy X will be unveiled at CES. Next year CES will officially start on January 8, so the champagne bottles from New Year’s Eve will still be half full. This year Samsung unveiled the Exynos 9810 chipset, but its CES presence was focused on TVs, laptops, SmartThings and, yes, Bixby. The Samsung Galaxy X is the mythical foldable phone. Its screen will go from 4.5” to 7.3” when unfolded. Even its battery will be flexible, its capacity is still TBD but will be between 3,000 mAh and 6,000 mAh. 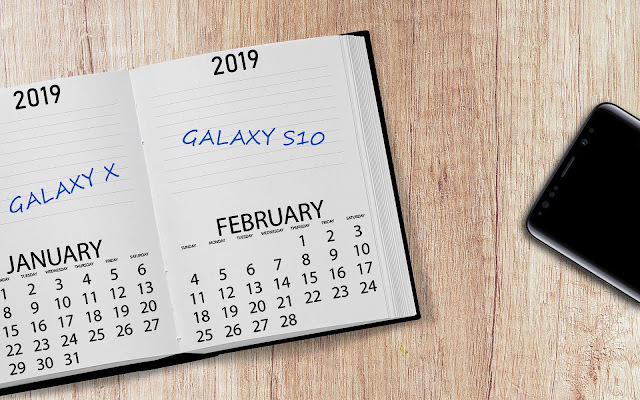 The Samsung Galaxy S10 will be unveiled at MWC (at the end of February) as usual. The design was reportedly finalized earlier this year with three cameras for the Plus version, an in-house UD fingerprint reader and facial recognition. PS. this launch schedule is the exact opposite of what was rumored a couple of months ago.